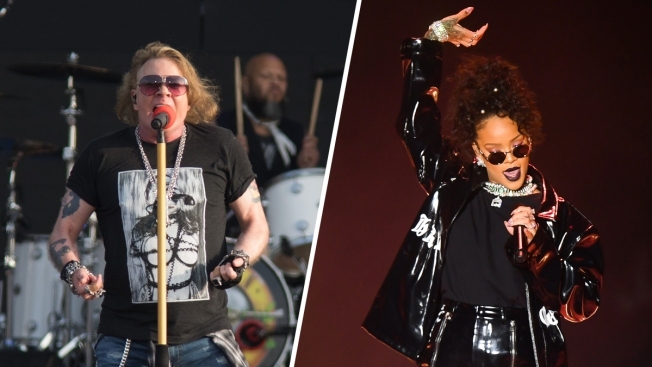 Axl Rose (left) and Rihanna have joined a growing list of musicians decrying President Donald Trump's use of their music at his events. Rihanna and Axl Rose over the weekend joined a growing number of musicians who have denounced President Donald Trump's use of their music at his events. Rose, the lead singer of the rock band Guns N' Roses, tweeted Sunday that the band has requested its music not be played at Trump events. "Just so ya know... GNR like a lot of artists opposed to the unauthorized use of their music at political events has formally requested r music not b used at Trump rallies or Trump associated events," Rose said. He later added, "Unfortunately the Trump campaign is using loopholes in the various venues’ blanket performance licenses which were not intended for such craven political purposes, without the songwriters’ consent." Meanwhile, Rihanna said Sunday her music would not be played for "much longer" following a tweet by Washington Post journalist Philip Rucker, who said her song "Don't Stop the Music" was played at a Trump rally in Tennessee. "It’s been said a million times, but here’s a million and one — Trump’s rallies are unlike anything else in politics," Rucker wrote. "Currently, Rihanna’s “Don’t Stop the Music” is blaring in Chattanooga as aides toss free Trump T-shirts into the crowd, like a ball game. Everyone’s loving it." Rihanna retweeted Rucker, adding, "Not for much longer...me nor my people would ever be at or around one of those tragic rallies, so thanks for the heads up philip!" Several musicians have decried the use of their music at Trump's rallies, including Steven Tyler of the band Aerosmith, the Rolling Stones and Adele. Pharrell Williams most recently expressed opposition to the use of his music at Trump's events, sending a cease and desist letter to the president and threatening to sue him after he played Williams' song "Happy" at a rally.